Did I mention what a big Nerd I am? I love sitting in a classroom letting somebody teach me something. I feel like a big sponge, just absorbing information. Needless to say I am enjoying my course with the Italian Sommelier Association (AIS). It’s truly been an Italian Wine Geekfest of Epic Proportions, especially when somebody broke out the Gaglioppo! Last weekend I found a new region to become obssesed with… Calabria! 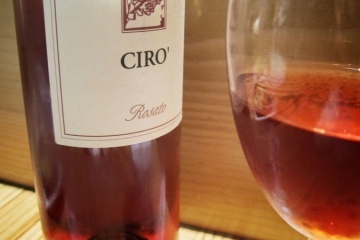 We tasted a 2008 Ciro’ Classico from A’ Vita. This wine is 100% Gaglioppo. 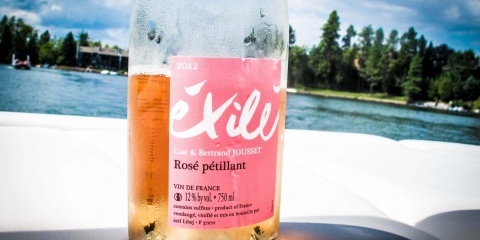 The wine was pale purple, with a delicate and earthy nose of blackberries, middle-eastern spices and salty sea air. I detected a hint of cardamom as the wine opened up in my glass- definitely exotic! Calabria… a region to watch and one I intend to learn more about as soon as possible. Image of the vineyards on A’ Vita’s property. Calabria is home to hundreds of undiscovered native wine grapes. Hopefully the growing interest in encouraging and protecting Italian wine traditions will bolster the region’s efforts to catalogue and understand them all. If the A Vita’ Ciro’ is an indication, the potential for Calabrese wine is truly unlimited. Bravo! Play the video above to hear Francesco de Franco pronounce the word “Gaglioppo”. From Jeremy Parzen’s Italian Grape Name and Appellation Project. Maybe its because you are part Calabrese! Susannah- I can’t wait to see for myself. I am sure it will be a beautiful place to visit! The class is at the Wine House in LA through the North American Sommelier Association. I believe they will run a second course next month in San Francisco at Perbacco. if you come to visit in Calabria, you’ll appreciate! … the mountains, the beaches, the sea, vineyards and olive secular it’s are fabulous … are full of charm with their history, culture and ancient tradition! I’m producing DOC Cyrus and I’m sure you and Jeremy if you visit my country you will be amazed! I’m producing DOC Ciro’ and I’m sure you and Jeremy if you visit my country you will be amazed! Ciao Giuseppe! I can’t wait to visit Calabria! I will also look for your wines in California- do you have an importer in the US? Thanks Joanie. I strongly believe that Gaglioppo it’s a great grape. we must respect it to produce a good wine of terroir. Thank you Francesco, for your comment! I agree- Gaglioppo is a noble grape, with great potential. I look forward to visiting Calabria someday in the future and tasting many more examples! Great news! you will be welcome!